the ball for Game 2 of the ALCS? Although the Red Sox opponent is not known quite yet, Major League Baseball announced today the start times of both league championship series, with the NLCS beginning Friday and the ALCS Saturday. For the Fenway Faithful, the first two games of the series will be in primetime. Saturday’s Game 1 will begin at 8:07 pm ET and Sunday’s Game 2 will be at 8:15 pm. When the series shifts to either Oakland or Detroit for Games 3-5, the times change slightly to accommodate both series being on the same day. Game 3 will begin at 4:07 pm Tuesday, Game 4 is set for 8:07 pm Wednesday and Game 5 is 8:07 pm Thursday. If the series comes back to Boston, Game 6 is tentatively set for 4:37 pm Saturday, Oct. 19, and Game 7 will be 8:07 pm Sunday, Oct. 20. The time for Game 6 could change to 8:07 pm Saturday if the NLCS is over. All ALCS games can be seen on Fox. Farrell also confirmed that Jon Lester would be the Game 1 starter, but the rest of the rotation would be announced tonight following the ALDS Game 5 between Detroit and Oakland. The question is who starts Game 2? The reason that is a question is because the starter of Game 2 is likely to be in line to start Game 6. Something that isn’t over looked there is that Games 2 and 6 are at Fenway Park and Farrell would like a starter who is most comfortable in his home setting. Add to that that he would like a starter for Games 3-5 who is comfortable on the road in a tough environment. For example, Clay Buchholz is 1-2 with a 9.58 ERA in his career at Oakland, whereas John Lackey is 9-5 with a 2.83 ERA in his career there. This is just one of many stats that Farrell and pitching coach Juan Nieves must analyze prior to the weekend, so don’t let it sway you too much. In an interesting note, Farrell said at his press conference today the he believed Jake Peavy would “thrive” out of the bullpen. That statement likely would mean the Sox are looking at Peavy coming out of the pen in Games 6 or 7 (if he pitches Game 4, as was the case in the ALDS). Personally, my vote for the Game 2 starter is Buchholz, who could use a start at home and likely dominate either the Tigers or A’s. That sets up Lackey for Game 3 in Oakland with Peavy and Lester to follow. 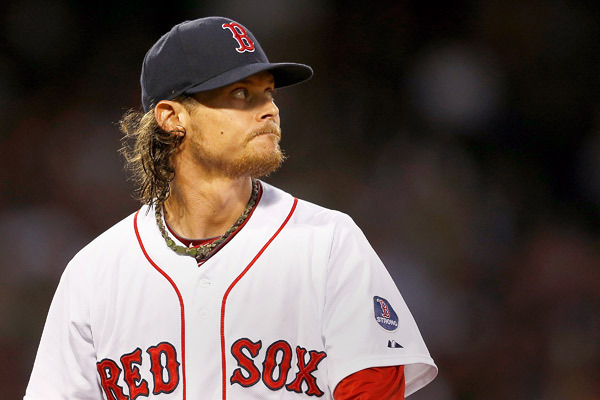 If Games 6 or 7 are necessary, you would have Buchholz and Lackey on the mound with Peavy out of the pen. You couldn’t ask for two better competitors for the final two games of the series. And the thought here is that both would pitch well in front of the home fans in big-time situations. It's actually a good situation to be in because any of the three after Lester could be the Game 2 starter. That kind of confidence is something Farrell has instilled in his rotation since Spring Training and has gone a long way. All the way to the ALCS. As always, count on Red Sox Life to bring you all the info for the Red Sox and their upcoming ALCS matchup. We will post breaking news as it happens.